The morning separation is very different for each family, as they have developed their own rituals for saying goodbye. Since few children arrive before 9:00 a.m., those who signed up for before care are greeted in a common area in a mixed age group. Those who arrive after 9:00 a.m. are greeted in their own classroom. Arrivals take place between 8:00 – 9:00 for before care and 9:00-9:30 a.m. in regular classrooms. Snacks are served in our classrooms and children eat together at tables with the teachers. Morning Snack is served between 9:30 and 10:00 a.m. and Afternoon Snack is served between 3:30 and 4:00 p.m. Teachers often take this time to read stories or share information with the children. explorations to small group work time. The children and educators sing together, share news, discuss classroom happenings, and count the number of people present. Children work in small groups within the classroom. On a typical day there are several small groups, each one working closely with an educator and usually focusing on an exploration of materials and /or spaces in the school or project work around a particular topic or goal. Children are encouraged to engage with their peers and engage in gross motor activities. The teachers plan soccer games, follow the leader activities, and encourage the children to go on "expeditions." 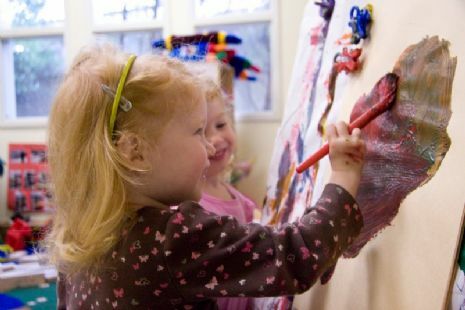 The children explore the outdoors and engage with water, sand and paint. The children tend to our gardens and get in touch with nature. For older children, rest mats are provided and quite rest time is observed for 40 minutes. Children are picked up at different times during the afternoon, depending on the child’s contracted schedule. 1:00, 2:00, 4:00 and 5:00 are the most common times for pickups. Parents are encouraged to arrive at least 10 minutes before their child’s scheduled pick up time so that they can have time to speak with educators and read any parent board information, as well as help the children to have a smooth transition from Chai preschool to home.